Yesterday saw the annual Blessed Sacrament Procession for the Deaneries of Bexley and Greenwich. It was raining quite hard in the morning and at 3pm there was an overcast sky, light rain and uncertainty about what might happen, rain-wise in the coming hour. Fr Michael Scanlon (Dean of Greenwich) and I took the decision that we should shorten the procession and have Benediction. That way, if it really poured, we could finish quickly. As it turned out, even with quite considerably reduced numbers, it was a really joyful and devotional occasion. Archbishop Kevin McDonald participated this year, preaching and giving Benediction at the end. 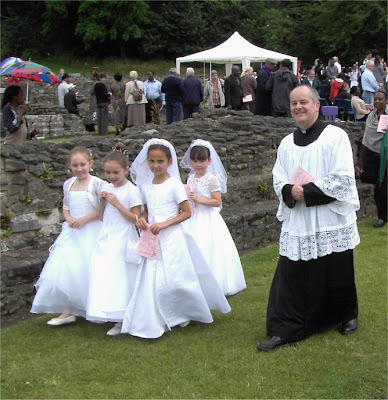 There are some photos over at my parish blog (Lesnes Abbey Procession). This is one from after the procession with me walking some of our first Communicants back to the meeting point.